What I'm loving: The warmth of just-tumbled clothes from the dryer. Today is unexpectedly chilly, with a gray drizzle that stops and starts, set against a similarly slate-gray sky. I pull on my softest long-sleeved t-shirt, an old heather gray one that's worn around the cuffs and neck, emblazoned with the name of my college. Weather like this merits warm beverages, and I welcome a non-iced coffee. I have errands to run downtown in the West Village. I stop at a cheery little Australian cafe. The barista shouts to the line cook in the tiny, cramped kitchen. "Mate! I need a brekkie bowl and two avo toasts." I'm not making that up. He is blond and suspiciously tanned for Manhattan and grins at me before taking my order. A waitress in jeans, a blue apron tied around her waist, with a freckled complexion, generous curves, and gorgeously sunny smile bumps against me. She apologizes in the same friendly, open Australian accent. It makes me want to buy a pink and yellow striped surfboard and move to Bondi Beach. I order my usual: a golden milk latte made with half regular milk and half almond milk. It arrives in a jaunty blue paper cup. The steaming liquid inside is electric yellow from the turmeric and dusted on top with cinnamon. It's sweetened with dates and spiced with Himalayan pink sea salt and vanilla bean and ground ginger. I sip it slowly on the walk to the subway. As I'm casually spilling half the cup down my white cashmere sweater, like the cool kid I am, I pass a little girl walking hand-in-hand with her dad. It's 3 PM and she must have just left school. She has that giddy, must-run-off-the-day-jitters, manic energy about her. She's adorable in pink overalls and sneakers, her curly hair wild about her soft, chubby face. Her dad swings her arm as they cross West 12th Street. An older man passes in front of them with an earnest, white-haired dog on a leash. It leaps up at the little girl, barking frenetically. She looks startled, and then wildly happy, tentatively reaching her hand out to pat his wet tongue, his soft nose, his fur. The expression her dad gives her makes my heart soften and go warm and melty around the edges: proud and happy and patient. I keep walking. I pass a sleek bakery with high glass windows selling fancy, precise-edged brownies and croissants and soft-serve ice cream in homemade cinnamon-scented waffle cones. Two women of an indeterminate middle age confer seriously at the bakery counter. They look like they work at Vogue: matching severe-looking ponytails, crisp architectural white blouses, cropped pants, and heels with a vaguely European feel to them. Slim and self-assured, they order. Vogue #1 gets a brioche doughnut, Vogue #2 some sort of chocolate cookie. A block later, I watch a couple sitting at an outdoor cafe table at a cozy restaurant called The Meatball Shop. The waiter places a bowl of meatballs in front of them, submerged in a steaming tomato sauce with some sort of serious melted cheese situation on top. He reaches across the table and brushes her hair off her cheek. She grins and spears a forkful of gooey mozzarella, waving it in his general direction, gesticulating enthusiastically as she speaks. People everywhere. Eating, drinking, riding the subway. Calling their mothers. Calling their husbands. Rummaging through their bags for grocery lists, for a dollar bill to buy a banana at the sidewalk fruit stand, for a forgotten tube of Chapstick. I wander through them, cutting a path into the park. I walk along the diagonal sidewalk that skirts the little Le Pain Quotidian cafe at the edge of Sheep Meadow. 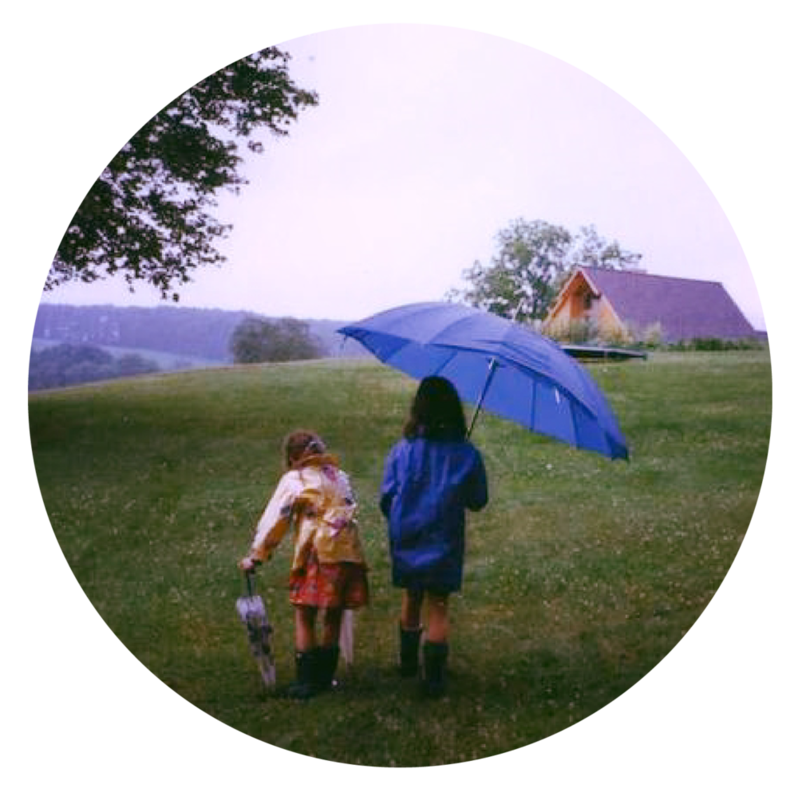 I stand in the lightly falling rain and I see my sister at a distance. Her gait is more familiar than my own. I can pick her out in any crowd: her pink and blue canvas bag, her ponytail swinging, her purposeful walk. Her tan skin. My heart swells when I see her, even if it's only been a day. Upon seeing any of my three sisters after a time apart, I always feel an acute seizing of my chest, then a loosening, like I've been homesick for something without realizing I was. We chatter about little and big things. Dates and dress choices for upcoming parties and the rain and whether we're tired and what to buy for dinner and the rain again and "do you like this perfume?" and "let's walk down 75th instead of 74th" and nail polish colors and half of it in British accents because why not. I leave her to stop in the butcher shop for meat: a pound each of ground sirloin and ground pork. At the grocery store, I select carrots, celery, mushrooms, fresh rosemary and parsley and thyme. I grab rice cakes, because hello have you slathered those in butter and eaten them? Do it. At home I drop my bags, turn on the stove, and start cooking garlic and diced yellow onion in olive oil. By the time I've progressed to the carrot and celery phase, he walks in the door. Ray LaMontagne plays on the speakers. He's in his bright blue and red workout gear, bike helmet on, backpack slung off one shoulder. As he showers, the vegetables soften and I add the meat with salt, fresh thyme, and a glug of Worcestershire sauce. He comes into the kitchen, clean and smelling of soap and shaving cream. He pours a glass of Tempranillo; I take the bottle and pour a cup of it into the pot with the simmering meat, along with a generous dollop of tomato paste, a can of crushed tomatoes, and a little tamari. The tamari adds a nice savory element to bolognese sauce, although it's not necessary. A splash of fish sauce does the same trick. The sauce cooks down. I pull out two plates. A handful of baby spinach on each, then some leftover mashed sweet potato, all wilted by the heat of the sauce I spoon over the top. And then are cookies. We eat them straight from the freezer. 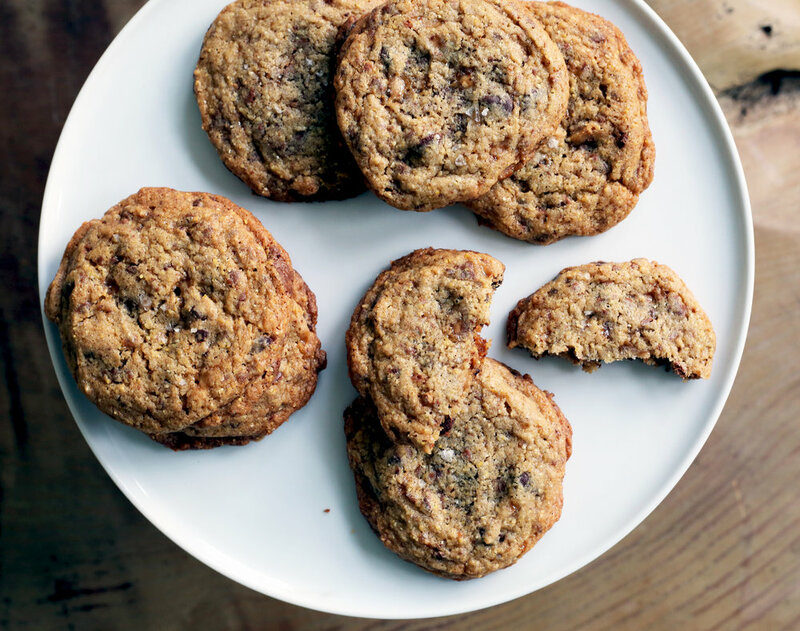 These are classic chocolate chip cookies that I've dressed up a bit. I add coarse yellow cornmeal to the dough, which gives it some texture and crunch, plus toffee bits, because those are just reeeeaallly good. Topped with a sprinkling of sea salt, they're excellent plain and even better crumbled into a scoop of vanilla ice cream. 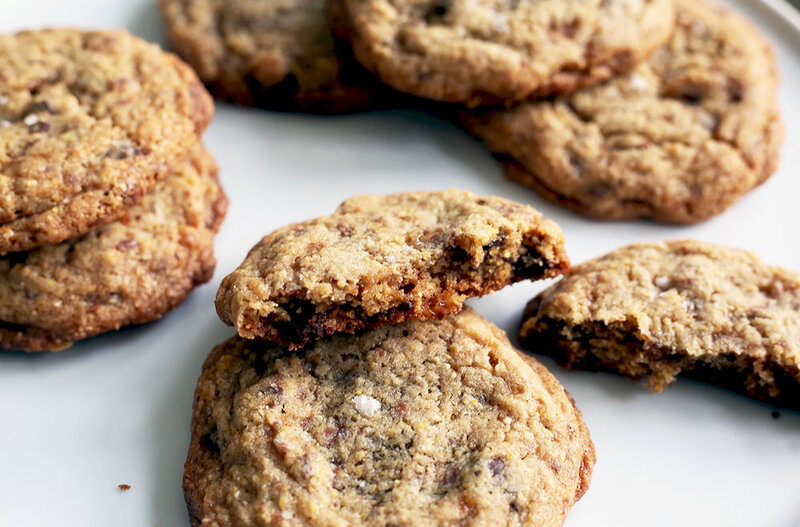 I don't usually mess with a classic, but these little tweaks serve to simply boost the best aspects of a chocolate chip cookie without taking it too far into new flavor realms. Leave out the toffee if you like, but I highly recommend trying the cornmeal and sea salt. Cream the butter and sugars until light and fluffy. Add the vanilla and salt and mix. Add the eggs and beat until smooth. Add the flour, baking powder, baking soda, and cornmeal and beat until just mixed, scraping down the bowl as you go. Add the chocolate chips and toffee bits and beat until just combined. Drop the batter by spoonfuls (I used a tablespoon cookie scoop) onto a parchment-lined baking sheet. Leave at least 2 inches between the cookies as they will spread a bit. Sprinkle the top of each cookie with flaky sea salt (I like Maldon), and bake for 10-15 minutes or until golden brown on the edges. Let cool on the sheet until firm enough to transfer to a cooling rack.